Just how complex is your noggin? Pretty damn complex, according to researchers at Stanford. Their new imaging technique discovered that synapses are actually more like individual microprocessors than simple on/off switches, and your brain has hundreds of trillions of them. Their findings, reported in the current issue of the journal Neuron, are based on a new imaging technique called array tomography that stitches image slices together into a full 3D model. 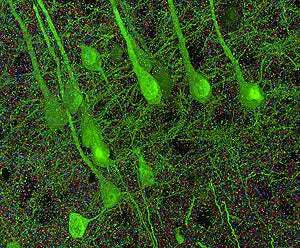 The video above shows tissue from a mouse's brain, its neurons engineered to glow in neon green so the synapses could be distinguished against them.